If you’ve got involved in Android software development, you’ll soon notice that the Google Play store features hundreds of thousand Android apps. Some of them are extremely popular, some remain almost unnoticed by users. 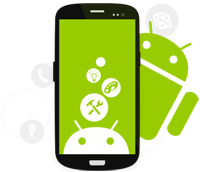 If it’s your first Android app to develop, you should find ways how to make it outstanding. Here are 9 great tips that will direct your activity in the right direction. Google has already developed a set of helpful guidelines for building great and consistent apps. If you follow these closely, your users will intuitively grab how your app works and enjoy it much more. Google tends to occasionally release new updates to its SDK which give developers new ways to do things. Try to keep your app updated constantly to be in the lead of those to implement new features in order to stay competitive and provide users with better experience. When it comes to app improvements, the best thing you can do is ask for user input. Users really love it when app developers seriously take their feedback and implement it in their product. The easiest way to get user feedback is to create your app’s community on Google+, for example, and ask for reviews. To be at Android development, you should think Android. It’s imperative that you yourself use an Android device as much as possible and participate in the multiple and vibrant Android communities on the web. What distinguishes Android from other mobile platforms in the first place, is the diversity of devices supporting it, each with a different screen size and characteristics. Though it’s virtually impossible to test your app across all of them, you should look for ways. One thing to ensure cross-device consistency is to use density-independent pixels. Users hate it when their app performs slowly and takes up much unnecessary space, that’s why optimization is crucial for your app’s success. One of the common mistakes of many beginners you should watch out for is using unnecessary variables or objects. With the increased malware rate in Android, many users have become more cautious with the things they download. When they see a long sequence of permissions for your app or that they are requested too much data, it’s very discomforting for them. Try to minimize these as much as possible. The main idea is: try to find the balance between monetizing your app and still ensuring great user experience. Users don’t like feeling like app creators care only about money. The most important tip about developing anything is having fun during the work. The app development business should feel like your hobby rather than a chore. Only when you are passionate about what you are doing will you be successful. And you surely will!